I was recently asked for a “New Orleans type dessert” at the restaurant. I was excited to come up with these Banana Caramel Tarts with Rum Pastry Cream and Pralines. The first bite will take you to Mardi Gras. 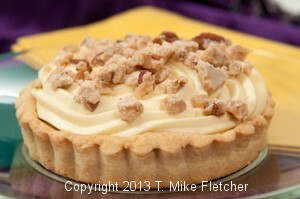 The New Orleans Praline below is the only recipe not in the European Tarts book. The pastry cream is increased by 1/3 and dark rum is added. Just use the ingredients given here and the instructions for Pastry Cream in the book and on the blog. This praline is to one of the best things I have ever eaten. And eat it I did! Once it cools, it has an opaque, almost grainy look. When the pecans have been added, the candy sets up almost immediately, so get it onto the prepared sheet pan and spread it out right away. This tart can be executed in steps. The tart shells can be made a day or two in advance as can the pastry cream. The caramel and praline can be made a week ahead of time. However, these Banana Caramel Tarts with Rum Pastry Cream and Pralines should be assembled the morning of service. This entry was posted in Blog Posts, Front Page, Recipes and tagged Banana, caramel, New Orleans, pastry, pastry cream, praline, rum pastry cream, tart on March 25, 2013 by hfletcher. On page 5 of European Tarts there is an error. 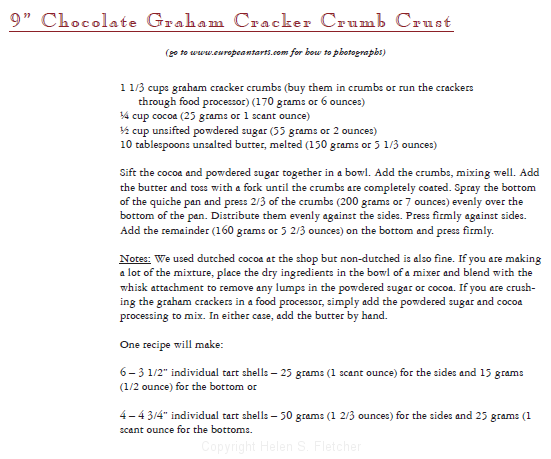 In the third paragraph (after the ingredient list) it says, “Divide the dough in half (175 grams or 6 ounces). Divide one piece in half again (85 grams or 3 ounces). Roll one quarter of the dough (85 grams or 3 ounces) evenly into a rope”. Please make the correction in European Tarts. I am sorry for an inconvenience. This entry was posted in Blog Posts, Front Page and tagged 11" Press in Crust, European Tarts, pastry, pastry crust, pastry shell, press in crust on April 13, 2013 by hfletcher. 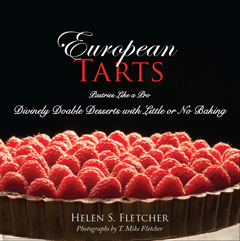 Helen Fletcher was on KMOV twice in the past few weeks talking about her new book, European Tarts. Watch them below! This entry was posted in Blog Posts and tagged caramel, chocolate, kmov, video on January 1, 2013 by admin. 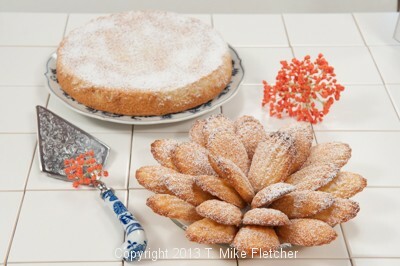 To get the recipe for this Orange Almond Teacake or Madeleines, please go to http://www.flourmewithlove.com/2013/04/orange-almond-teacake-or-madelienes.html to view a guest post I did for this blog. We served the orange almond madrilenes as petit fours at the shop. They were always hugely popular. This entry was posted in Blog Posts, Front Page, Recipes, Uncategorized and tagged almond, almond paste, madrilenes, orange, teacake on April 7, 2013 by hfletcher. 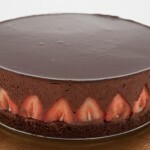 Please join me at my new blog, www.pastrieslikeapro debuting with this Chocolate Strawberry Mousse Torte. 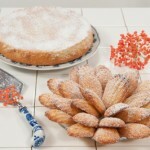 This blog is completely devoted to pastries and baking both sweet and savory. It’s the culmination of 23 years of owning my bakery and my experience as the pastry chef at Tony’s, St. Louis’ most acclaimed restaurant. This entry was posted in Blog Posts, Front Page and tagged baking, blog, pastry, www.pastrieslikeapro.com on June 14, 2013 by hfletcher. 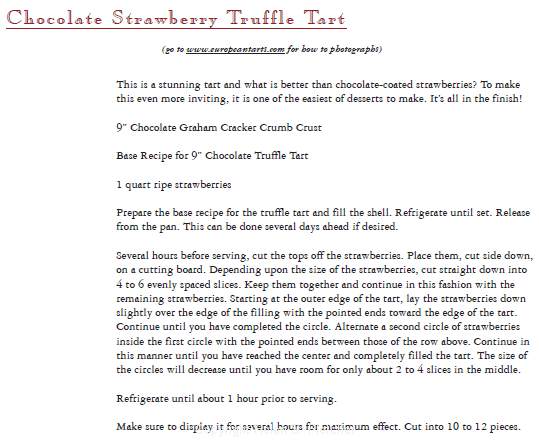 Below is a sample recipe for the Chocolate Strawberry Truffle Tart – one of the most sophisticated tarts in the book but also one of the fastest and easiest to make. Enjoy! This entry was posted in Blog Posts, Recipes, Uncategorized on November 20, 2012 by admin. 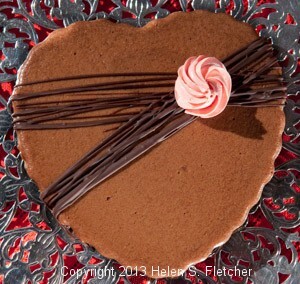 Triple Chocolate Heart Tarts – what could be better for Valentine’s day – or any day for that matter. Gorgeous, sophisticated, stunningly flavorful and easy – what more could you want in a Valentine’s dessert? When I had my bakery, we made so many of these both for Valentine’s day in these adorable tart shells and during the year when we made them in 12” European tarts, it was amazing. What’s “so many” you ask? What about 1500 pieces which amounted to 125 tarts for banquet desserts usually with only a few days notice? If you can’t find 4 1/4” heart shaped tart pans, use 4 1/4” round ones – the dessert will be just as gorgeous, sophisticated, stunningly flavorful and easy! Because these tarts are very short, there is only a small amount of “crust” on the bottom to anchor the filling. The majority of the filling is poured over the bottoms and allowed to set up in the cooler. The remainder is heated just to loosen it and combined with whipped cream for a third layer of chocolate. The finish I have used here is the one we used at the shop. The rosette is piped on with a bit of buttercream which we always had around. I have included a chocolate ganache if buttercream is not to be had. It is best to put the top layer on as soon as the bottom layer has set, then freeze them in their pans overnight or until ready to decorate. Using a blow dryer to heat the rim of the tart pans heats them enough to slide the edge off. Just be careful not to overheat the edge or it will start to run. We would place the pans on a can and slide the side down. Slide a small, straight spatula between the bottom of the tart and the bottom of the pan. This recipe makes 8 Triple Chocolate Heart Tarts. Mix the crumbs, cocoa and sugar together, rubbing between your fingers until the cocoa and sugar lumps are gone. Add the butter and toss with a fork until the crumbs are completely coated. At this point the crusts need to be pressed in immediately or the crumbs will dry out. Press two firmly packed, slightly heaping tablespoons into the bottom of each pan. Yields: 8 – 4 1/4 inch tart pans. Dissolve coffee in the water. and the mixture is steaming, but not boiling, stirring frequently. Remove from the heat and submerge the chocolate underneath. Wait for a few minutes for the chocolate to melt. Whisk to smooth the chocolate. Whisk in the yolks and lastly the brandy. Pour 1/4 cup filling into each tart pan. Rotate it to fill all the ridge and tap several times on the counter to knock out any air bubbles. Continue for 7 more tarts. Refrigerate the tarts to firm the filling. Cover the unused filling with film. Set aside to room temperature. When the filling is firm, beat the cream just until soft peaks form. Microwave the chocolate filling for a few seconds to loosen it up if necessary. Fold the cream and chocolate together. rotate it around so it fills the shell to the top.Shake it sideways a couple of times to level it our. Place on a tray. Continue with the remainder. Place in the freezer and freeze until hard. Place one tart on a small can such as a six ounce can of tomato paste. With a hair blower on high, go around the edge of the shell holding the dryer about 2 inches away. Go around one or two times and see if the rim of the tart pan can be pulled down from the tart. 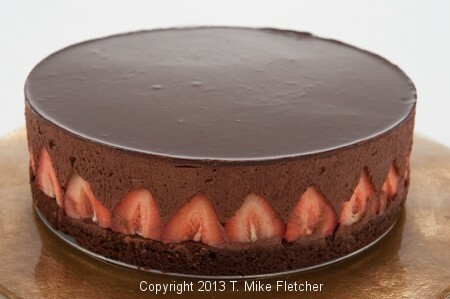 If it can’t or it is difficult, continue to heat the edge with the blow dryer until the tart pan rim can be released. Be careful not to heat the edge too much or the tart will melt. Place a small spatula between the bottom of the crust and the bottom of the pan to release the tart. Place the tarts on a flat surface spaced several inches apart. Decoration – There are two suggestions for making the rosettes for the decoration. Either may be used or none. The first is a bit of chocolate ganache the second is buttercreamn of your chosing tinted with food coloring. If tinting buttercream, a gel works better than liquid coloring. For the chocolate ganache: Heat the cream until simmering, but do not boil. Submerge 4 ounces of chocolate under the cream and wait for a few minutes. Whisk to smooth. Pour it out on a plate and let sit at room temperature to firm up. For the buttercream: Tint the desired color. To Finish: Fit a small pastry bag with a number 2 open star or number 2B tip and fill with either the chocolate ganache or buttercream. Melt the remaining 2 ounces of chocolate in the microwave on half power or in a double boiler. 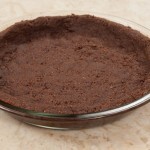 Dip a spoon into the melted chocolate and wave it left to right over the tart as shown in the photo. Dip it again into the chocolate and wave it back and forth on the diagonal. Let the chocolate set up briefly. Pipe a rosette of either the chocolate ganache or the buttercream the lines intersect. Store in the refrigerator or freeze. Serve at room temperature. This entry was posted in Blog Posts, Recipes and tagged chocolate, individual tart, tart, triple chocolate heart tart, triple chocolate tart, valentine's on January 31, 2013 by hfletcher.